If the horse’s foot is not landing correctly when he walks or runs, the cartilage becomes compressed. Cartilage flattens and degenerates under constant compression. The cartilage may wear completely away. Bone rubs against bone which can result in equine lameness. Tendons can also rub against the exposed bone causing inflammation. While horse joint supplements may help rebuild cartilage, the underlying problem needs to be addressed. If a horse lands on its toes rather than its heels, the foot bones will be compressed. Ask your equine veterinary specialist to check the horse’s feet for hoof malformation as well as proper shoeing and trimming. Tension is another theory used to explain the origin of navicular disease in horses. Too much tension on the ligaments of the feet causes inflammation and pain. The ligaments may become thicker and reduce the blood flow to and from the bones. Veins are compressed more easily than arteries. Blood gets trapped in the bone causing minerals to be leeched from it. Horses with certain builds are more prone to develop navicular disease. American Quarter Horses often have a build that makes them look like they are going downhill. 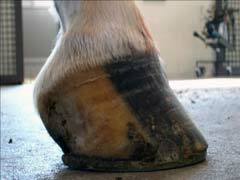 That and having upright, narrow, small feet can predispose this breed to navicular disease in horses. Thoroughbreds frequently have low heels and long toes. In both cases, the heels are subject to pressure and concussion. Since the navicular bone is located in the heel, the very build of these horses predisposes them to this disease. If your horse exhibits lameness, talk to your veterinarian. This disease may require surgery.